Posted by nrhatch in Art & Photography, Humor, Life Balance. After posting, I noticed that this is post #1300. And “13” is my lucky number. awesome, i so want to go there!!! The best donuts we’ve ever eaten, but . . . the owners moved to Philadelphia. Don’t know if they reopened there. This quote is perfect for post #1300! It was the first thing I saw when I woke up this morning (no pun intended! ), and a great way to start the day. Thanks, Nancy. Congratulations by the way! I am so glad you saw it when you “woke” up this morning! Here’s to being awake and aware! If you can put a huge smile on someone’s face (whom you’ve never met from a few thousand miles away), then I’d say hooray to your 1300th post. It must mean you’re on the right path, Nancy…but I think I’m going to have to pass on the donuts! 🙂 Have a lovely day. Looking at this Buddha (or the Dalai Lama’s smile) ALWAYS makes me smile. Adorable sign and a great quote! Thanks, Rosa! The Buddha’s smile makes me laugh. What a sense of humour! 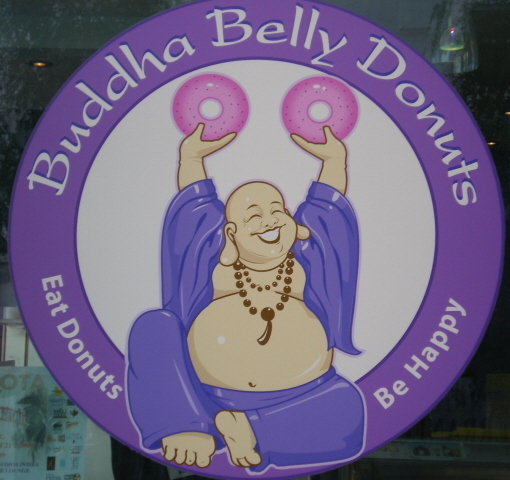 The Buddha is one happy camper alright – just look at that smile! Aah . . . the joy of the present moment. Bliss! Welcome back! I’ve missed you, but assumed you were busy taking the next steps on your path. Sound like you have been . . .
I’ve heard that, with appropriate gratitude, all food offers nourishment to our bodies.